Last day of the month. In honor of the bottle of the month I went out and picked up another bottle today. I bought a bottle for my "bunker" today too, as my other bottle is less than half full. Time for an end of the month pour to celebrate the bourbon of the month. Now, if only my Wildcats could rally in the second half. 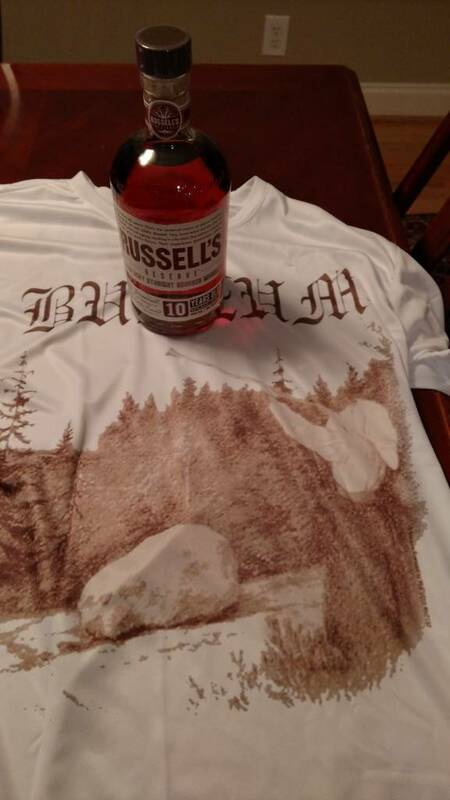 oday I bought my first bottle of RR10. I just had my first glass of it neat. It has a thicker, more syrupy texture than my other bourbons. I drink it on my back patio during a thundersleet and this bourbon pleasantly warms me. I like the sweet kick of this first glass. When I was 21 and I first started drinking bourbon, Wild Turkey 101 was one of two bourbons that I would drink (the other being Smooth as Silk Kessler). This certainly reminds me of WT101, but smoother and thicker. I was in Biloxi for a weeek last summer and hung out at a very nice restaurant most evenings. Unfortunately, although the food was great the bourbon selection was weak. It had the usual suspect like Beam and Makers but nothing that got my attention, until I noticed the RR10 hidden at the back of the shelf. It was a new bottle and the barmaid was not familiar with it, nor was I, but I thought I would give it a chance. Over the next three nights I drank the entire bottle. Since then I have bought more as well as the single barrel. I am no bourbon expert, but I know what I like. RR10 is good stuff, the SB is even better and I find the Rare Breed to be outstanding. This was a good pick for BOM. Working on a bottle of this right now. It has some excellence, but also a little awkwardness until you acclimate to it. I've had it before. For the price, I continue to be drawn to it, its pedigree and its age statement. I bought my first bottle of this a week ago while on vacation, and I gotta say that it's some right tasty stuff. Basically tastes like Wild Turkey at a slightly lower proof and with a bit more age/wood influence. The only bad thing is my buddy and I hit the bottle pretty hard over a 2 day period (we've been hiking the Appalachian Trail in pieces, and were celebrating finishing a big piece), so there's not much left. I guess that's a good excuse to get more though.